Most of our users obviously come to Coin Brief for the latest Bitcoin, or other Digital Currency / Cryptocurrency news and analysis. However, our site has a lot of content that is not immediately obvious, nor easily accessible. I have begun to create this navigation tutorial, and will complete it as quickly as possible. Until that time, this will be available for users, new and old, to reference. Bitcoin, Coin Pages, News, Price Charts, Difficulty Charts, Mining Calculators, Graphs, Leaderboards and More? Yes, we have all of this, and they will be getting a serious overhaul/update with the new site. We will also be introducing many other features and services. How Do I Navigate All of These Pages, and What Are they? In order to make this simple, I've numbered a screenshot of our home page, and will explain each point. Please, if you have any questions afterwards, or think that I have no explained something thoroughly enough, let me know. I will update this post to clarify, as I do not want anyone to be confused. Coin Brief, and I, can be contacted via any method on our contact page. To simply it, feel free to email us at [email protected]. By clicking on the orange arrow at the top left of the screen, or on this link, you can open our sliding navigation sidebar. This sidebar contains multiple ways to navigate our site, as well as access to account related tools. These will be covered more thoroughly in sections 13-16. As the title states, this menu is for navigating some of our core subjects. The menu drops down to offer a selection of "Interviews", "Investing", "Mining", and "Press Releases". Interviews - This option will take you to a list of our interviews with various members of the Bitcoin, or other cryptocurrency, communities. From entrepreneurs like Erik Voorhees and Josh Garza, to visionary inventor/entertainer Onyx Ashanti, we have quite a list of interesting people that have graciously given their time to inform the community of their viewpoints, developments, and ideas. Investing - Selecting this option will take you to our articles on day trading and investing. Whether you want to understand the basics of day trading Bitcoin, or would like to see a recap of the past week's prices, this is the place to go. Mining - Bitcoin mining hardware, cryptocurrency mining companies, cloud mining, and anything else related to cryptocurrency mining is found here. This one should be pretty self explanatory. Scrypt Mining Profitability Chart - Our Scrypt Mining Profitability Chart lists the top 20 Scrypt based coins in regard to mining profitability. We used a different algorithm than other sites, and thus our chart tends to change slower. Rather than constantly switching to the most profitable coin to mine for the next 2 minutes, we use a longer time period and average trading volumes to determine which coins are more profitable to mine without the need to constantly change. Of course, that does not mean that change is not sometimes necessary, but it is less frantic, and does not rely on mining and liquidating so quickly that only a select few miners will actually reach the promised profitability. SHA-256 Mining Profitability Chart - As the name suggests, this is similar to the Scrypt Mining Profitability Chart, but with SHA-256, unsurprisingly, Bitcoin is almost always #1. However, from time to time a coin will rise in value and push ahead, so it is still a chart to keep an eye on. Social Activity Leaderboard - Coin Brief's Social Activity Leaderboard charts the total number of followers and users for all of our supported cryptocurrencies across the social networks Facebook, Twitter, and Reddit. The total number of users is used to calculate a coin's rank, but the chart also includes the change in total users over the past 24 hours. This is useful for seeing which new cryptocurrencies are starting to gain momentum, and building a community, as well as which ones have a community that is shrinking. Cryptocurrency Wallets and Reviews - Bitcoin wallets are ever evolving, and various cryptocurrencies are constantly introducing innovative new wallets, such as the Reddcoin Social Wallet or Darkcoin's Darksend functionality. This option will bring you to all of our wallet reviews, analysis, and tutorials. It truly is amazing how much can be built into something as "simple" as a cryptocurrency wallet. What is Bitcoin? - The starting point for every newcomer to cryptocurrency should be learning what Bitcoin is, and how it works. This short guide attempts to explain Bitcoin in a way that is accurate, but without going too far into the technical details. If you think you know what Bitcoin is, or how it works, but you aren't 100% sure, you should check this out. What is Mining? - Bitcoin mining is a misleading term, and few actually understand what Bitcoin miners are doing. While, again, I try to avoid going into too much technical detail, this is a good starting point if you want to learn the basics of Bitcoin, and other cryptocurrency, mining. Where Can I Get Coins? Direct Purchase and Exchanges - This menu option has 3 choices. By clicking directly on "Where Can I Get Coins?" you will be taken to all of our articles about Bitcoin ATMs, Debit Cards, Exchanges, and more. However, if you prefer to see only information about the places that you can directly purchase Bitcoin, or other cryptocurrencies, you can opt to select the sub-option "Direct Purchase". If you are only interested in seeing information about Bitcoin to Fiat Exchanges, or general Cryptocurrency Exchanges, then the sub-option "Exchanges" is the place for you. This section is a bit barren, and I will likely fill it in with more in the near future. The options here simply redirect you to one of three places, Hashtalk, the Bitcoin subreddit, or the Cryptocurrency Subreddit. However, if you know the coin code, and do not want to search through the list, there is an easy way to navigate to any Coin Page on Coin Brief. By adding /c/*** (where the stars are the coin code) to the end of https://99bitcoins.com/ you will be taken to that coin's page. 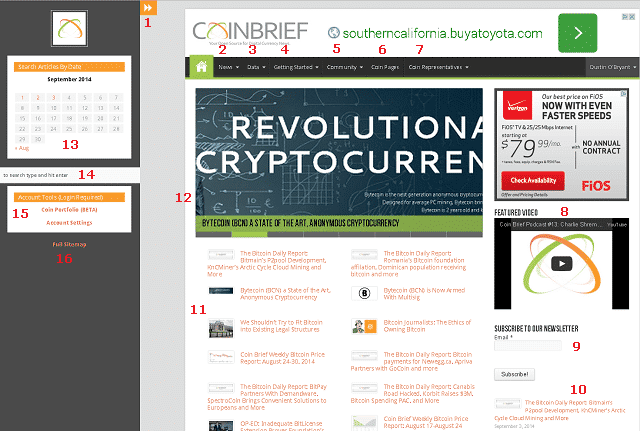 For example, the Bitcoin Coin Page is , the Dogecoin coin page is , and the Reddcoin coin page is . What is ****Coin? - While we previously mentioned the "What is Bitcoin?" article, that is not our only "What is" article for a cryptocurrency. Our "What is" articles are available as standalone articles, as well as embedded into the Coin Pages. Navigating to the "What is" tab will bring you to this, or you can simply add "whatis" to the Coin Page url to see if one is available for your currency of choice.Example: "What is Myriadcoin?"